Teaser one, out today, might be only 10 seconds. But as the first glimpse of this year's biggest budget film, and a make or break film for producing superstar Shah Rukh Khan, 10 seconds is a lot. A black-shoe'd foot leaves the ground, either running or taking off, a la Krrish. A bike rushes through a side street. A computer-lab is lit only by blue screens with code all over them. SRK, dressed for dinner but minus the tuxedo jacket (but with cummerbund, mind you) stands precariously in the gap between two train compartments, his bow-tie open around his neck. His hands go up for something presumably superheroic but, in realtime, looking unmistakably like the traditional Khan arm-raise. A car passes on a bridge. A figure in a black overcoat flies overhead, reminiscent of Krrish and The Matrix. A better view of the bridge, establishing that the backdrop is London. Kareena Kapoor in a little black dress, panicking, hand on chest as if her necklace has just been stolen. Onlookers looking alarmed as she screams for help or in anger. Close-up of Kapoor's eyes, wide and exhausted, next to a child as they both hide and watch something. A man in black with his arms outstretched does a Magneto and lifts a car 10 feet away from him. In the next shot, naturally, a group of android-helmeted dancers jiggle their midriffs. "Watch." Khan climbing the side of a moving train. Dancers wearing visors. A screeching car. Khan, dressed the same way with bow-tie askew, looks around intently as a family drama chaotically unspools around him. "Watch," the trailer instructs us again, in case we weren't listening first. Khan flies next to the train. He seems to be jumping in a way that suggests he is attaching himself magnetically to it, like Spiderman leaping onto walls. "WATCH," the trailer insists, rather forcefully. A hand, presumably Khan's considering he's still in the tux, holds a glowing red orb. There is a retinal scan and someone demonstrates a weapon -- a bionic arm, looks like -- while Khan and a woman look on. The first look." A car smashes straight through the side of a London double-decker bus. Someone in black with a cobra helmet rides a red bike through what appears to be a wedding. "The first look," the trailer repeats. The red orb glows. A hand -- either of a black robot or encased in black robotic armour -- presses against glass. Kareena looks bewildered while the little boy looks thrilled to bits. A rusty RPM meter revs up from 300-400. The train pulls into the station. Shah Rukh hangs on, now wearing shades and clenching his teeth. The man in the black overcoat leaps higher, looking even more Krrish-like now. Someone in shades talks to someone else, both hidden from view by a fast-moving vehicle. Close-up of Kareena, looking both dazzling and dumbfounded. The man in black jumping again. Shot of Shah Rukh, impassive, his eyes blue-grey. Back to him on the train, almost sandwiched between two trains this time. The man in black who can clearly fly seems to be landing. Again, the Krrish deja vu is strong with this character. From the side of the train, SRK and astonished onlookers stare upwards. Someone in grey-blue, clearly loving his Magneto gimmick, is now creating havoc by tossing many a car up into the air. A hand adjusts a glowing blue instrument that looks suspiciously like Iron Man's arc reactor. Khan half-flies between the train and then, in the next shot, we finally see him in grey-blue armour standing by a car that crashes to the ground. 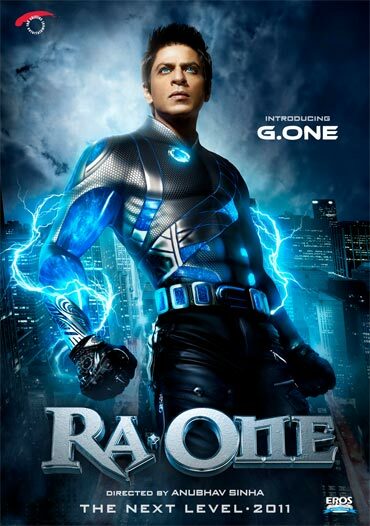 "Ra One," ends the trailer smugly, promising more soon. It is admittedly too soon to comment just yet, but I'm betting the Krrish-like man in black flying around is Arjun Rampal, the villain of the piece. Khan's too sharp to provoke an 'oh look, he's aping Hrithik' reaction, but then again that arc-reactor is a bit too hard on the nose to ignore. Are we looking at a truly original film, or one that 'borrows' liberally from existing superhero lineage? The effects look slick indeed, but this teaser makes one wonder if the train setpiece, clearly something Khan and director Anubhav Sinha are proud of, is the only thing they have to show, just yet. Well, we'll know more tomorrow. The longer teaser hits television screens during the India-Australia Quarter Final.